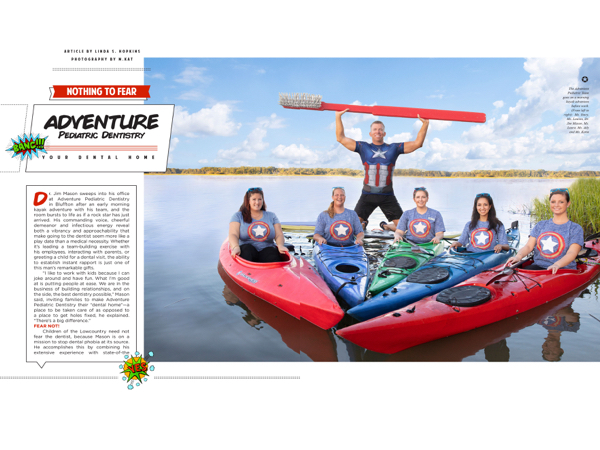 Dr. Jim Mason sweeps into his office at Adventure Pediatric Dentistry in Bluffton after an early morning kayak adventure with his team, and the room bursts to life as if a rock star has just arrived. His commanding voice, cheerful demeanor and infectious energy reveal both a vibrancy and approachability that make going to the dentist seem more like a play date than a medical necessity. Whether it’s leading a team-building exercise with his employees, interacting with parents, or greeting a child for a dental visit, the ability to establish instant rapport is just one of this man’s remarkable gifts. Children of the Lowcountry need not fear the dentist, because Mason is on a mission to stop dental phobia at its source. He accomplishes this by combining his extensive experience with state-of-the art dental equipment and up-to-the-minute techniques that make prevention and treatment a lot less scary. Eleven-year-old Steve M. just had his first cavity repaired, and is he ever relieved! His mom, Anne, was apprehensive at first about her son having the work done without being numb, but she was impressed by the amount of time Mason spent explaining everything. She and her husband were allowed to observe the laser procedure, which only took about two minutes, she said. Also in Mason’s toolbox are top-of-the-line digital x-ray sensors which provide superior images with less radiation and are easy to position and comfortable for children. Above every chair are televisions or iPads so kids can be entertained/distracted during dental examinations and procedures. “We have nitrous oxide. We do sedation when necessary. But sometimes it’s just a matter of taking the edge off. Sometimes it just takes a little relaxation,” Mason said. One of Mason’s most rewarding professional experiences, he said, is the diagnosis and treatment of lip and tongue ties, which are surprisingly common in newborns, making it difficult or impossible to latch on to the mother’s breast. “We specialize in frenectomies,” [the procedure to correct lip or tongue tie]. We have one-day-old babies coming in. I can fix it with a laser in 10 seconds,” he said. Immediately after treatment, moms are given the opportunity to work privately with a female lactation consultant to ensure success. “That bond between mother and child—we are able to give it to them,” Mason said. Further setting Adventure Pediatric Dentistry apart is the convenience of evening and weekend hours. “As a single parent, I get what it’s like running around. You do everything for them. It isn’t easy,” Mason said. Originally from Virginia, Mason moved to Bluffton from Ohio, via the military, where he served as an Air Force officer, giving up his pilot slot to become a military dentist, specializing in pediatrics. “For 12 years, I have been able to practice dentistry with no exchange of money, taking care of the children of the military. There was no focus on making a quota or paying the light bills. It was ‘how good can we be?’ That was our goal,” he said. After leaving the military and building a successful private practice in Ohio, Mason’s goal today is bringing the best to the Lowcountry—a place that feels like home for him. Mason lives his life the way he practices dentistry: making every day an adventure and treating everyone who crosses his path like the most important person on the planet. Get to know Dr. Mason, and make Adventure Pediatric Dentistry your child’s dental home. Adventure Pediatric Dentistry is located at 337 Buckwalter Place Blvd., Bluffton. Treatment is available for children from newborn to age 18 as well as for special needs children and adults. For more information, visit www.adventurepediatricdentistry.com or call (843) 815-6000 to make an appointment.